We hope you all had a great Memorial Day weekend with your family & friends! We were busy with events and it looks like April and May were just the start. We are working on a lot of great projects this Summer and plan to share them with you here. First, we are very excited to be working with the UVA Darden School of Business here in Charlottesville for the third Summer in a row to upgrade their classroom technology. 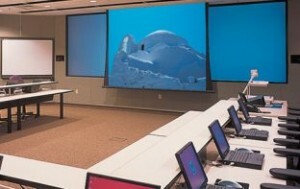 We have partnered with Dell, Mediatech and Crestron again this year to provide Darden with the state-of-the-Art facilities that they need to provide the latest in technology to their students. "Darden anticipates and embraces changing trends in information technology. The School builds cutting-edge technology into every classroom and learning experience. Professors employ a wide array of technology-enhanced learning tools, such as interactive simulations, to engage students in real-world exercises. They also produce digital content to complement the curriculum, including multimedia case studies produced by Darden Media and published by Darden Business Publishing. To stay at the forefront of MBA teaching, we must be the best at teaching in a digital world." Summer was a very busy time for us this year - we spent much of it getting local high schools & universities ready for this time of year - back to school! We noticed an increase in the need for more classrooms in general & more technology locally but now that things have slowed down a bit and we are catching up on our reading we have realized that it seems to be a trend nationwide as well! This article (link below) makes a great point - the recession seems to have encouraged many people to head back to school which means that the schools have to keep up when it comes to enough space and the classroom technology to keep up with new students. Also, because graduating students are entering companies that so have the latest technology, it is now even more important that schools keep up. I/T is more important than ever! Can you believe it's that time of year again? Students are heading back to school again here in Charlottesville and at the University of Virginia. Thank you to the Darden Graduate School of Business for trusting the AV Company to provide classroom technology for the Darden Executive Education Program! We also just finished upgrading the technology in their second year classrooms to support record enrollment for this coming year. Need technology for your school or university? 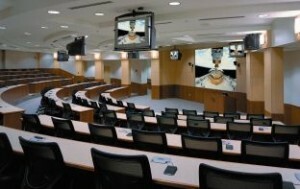 The AV Company offers audio-visual design & installation of technology systems for K-12 and higher education classrooms, auditoriums, theatres, sports facilities and daycare facilities. We provide teachers and other school personnel with professional training & support to ensure that they are comfortable using the new system once it is installed. We also provide security & notification systems to keep your students safe and energy management systems to make your buildings more efficient. We are currently providing the following technology solutions to school systems in Virginia. Please contact us today for a complimentary consultation!